My husband loves casseroles. LOVES them. I like the convenience of them. The make-ahead-and-forget-about-it potential. The "freezes beautifully" quality. But, I don't love that they usually pack a pretty heavy caloric punch with a not very favorable fresh veggie to creamy goo ratio. If you know what I mean. Enter the enchilada casserole. The addition of diced tomatoes, fresh poblano peppers and onions and the lack of milk, cream or butter tip the scales back to a more balanced dinner. And, when you're trying to lose a few (or, a LOT of) extra baby pounds, favorably balanced dinners are necessary. Cook ground beef and set aside. Saute onion, garlic and poblano pepper in olive oil. 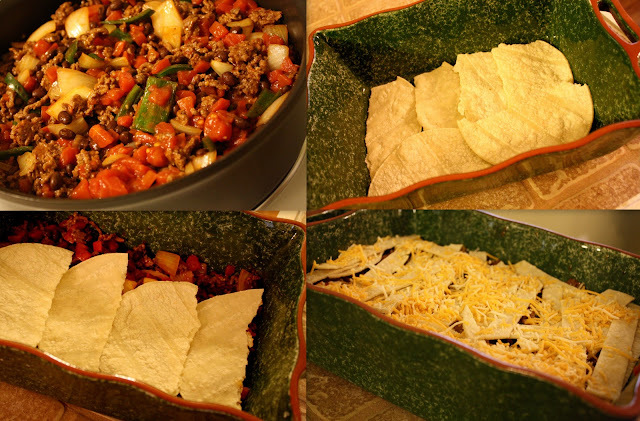 Combine onion mixture with ground beef and add black beans, tomatoes and enchilada sauce. Tear 6 of the corn tortillas in half, making 12 pieces and cut the remaining 2 tortillas into 1 inch strips. In a 4x8 or 8x8 dish place 6 of the tortilla halves. Follow with half of the meat mixture and then 6 more tortilla halves. Layer remaining meat mixture and spread corn tortilla strips on top. Sprinkle cheese over corn tortilla strips and bake at 350 degrees until cooked through, about 25-30 minutes. That sounds delicious! We love mexican around here so I'll have to try this! Witty repartee! Funny girl! Enchiladas look yummy! Sounds and looks fabulous and tasty! Thanks for sharing it.